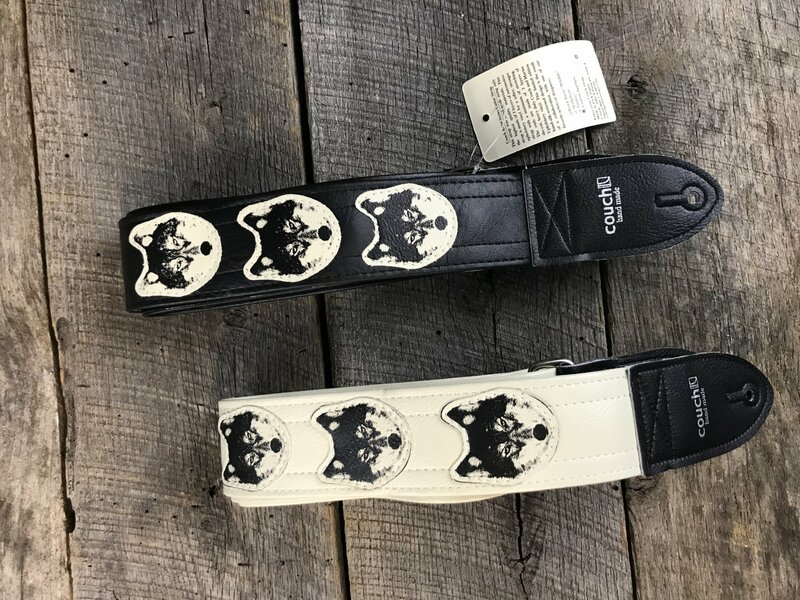 Presenting to you The Wolf Guitar Strap from Couch. Each wolf is hand silk-screened onto vinyl. We then then die cut each wolf out on our 16 ton press and hand sew three of them onto an a high quality strap made of new stock automotive and furniture upholstery vinyl right here in our California Workshop. For those about to rock. More on the construction: Sweatshop-free. Vegan. Double stitched on both sides, all custom stainless steel metal hardware. 3 hand-tooled rivets on the back tab. 1/2 foot longer than the average strap, cruelty-free, made in USA so that you may rock. Available as pictured in Black, White, or Multi-colored, just choose your preference in the drop down.